Throughout Africa’s Great Lakes region, many countries have adopted state-led transitional justice policies only to have most of these processes languish forgotten, delayed, or only partially-implemented. Against the backdrop of continued instability, civil society organizations are struggling to fill these voids, to respond to victims’ immediate needs while continuing to demand that the governments fulfill its obligations. Yesterday ICTJ launched a report titled Victims Fighting Impunity: Transitional Justice in the African Great Lakes Region, which examines the interconnected dynamics in the Great Lakes region and argues that each country’s attempt to provide justice for past violations offers lessons for similar processes in others. The report draws from not only ICTJ’s 11 years of experiences in the Great Lakes, but also from the voices of civil society activists themselves. 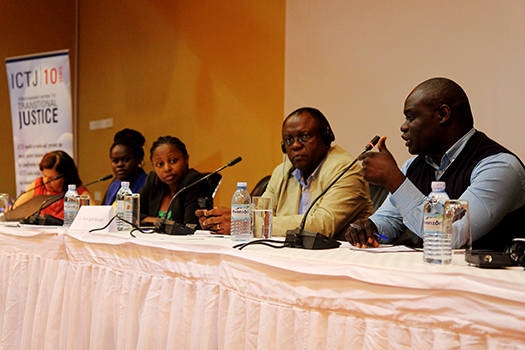 Civil society activists gathered alongside state representatives in Kampala, Uganda last May to share lessons from their work with each other. They discussed which tactics have worked for them, which have not, and opened up about the greatest challenges they face. We sat down with five participants to listen about the strategies they hope to implement in their own work and across the region. “I am learning from the approaches of other stakeholders, from other organizations. For example, I was pleased to see women in Northern Uganda trying to cope with their problems [regarding the stigma they face after returning from their time captivity by the Lord’s Resistance Army (LRA) –many of them are returning with children]. Jaqy Mutere (Kenya) is the founder of Grace Agenda, an organization that supports and advocates for victims of sexual violence and their children. “The exposure to other organizations and the interaction with both national and international organizations has enhanced my capacity to articulate the challenges we face and has fostered cordial relationships with the organizations who attended. I discussed strategies around engaging with government-led and survivor-led transitional justice processes. It was clear that grassroots organizing is critical – we must have the voices of survivors at every stage of implementation. Wachira Waheire (Kenya) is a coordinator at the National Victims and Survivors Network. Mme. Jolly Kamuntu (Democratic Republic of Congo) is the President of the Women of Media in South Kivu (AFEM), President of "Karité Jeunesse Nouvelles” (KJN) and is an active member of civil society in South Kivu. “I am a journalist by profession, so I have a duty to inform the population. In my job, I meet with victims of crimes and broadcast their testimonies. It has allowed them to speak out and break the silence because in our community, victims don’t speak about crimes, especially about sexual violence. Odong Jackson (Uganda) works for the Refugee Law Project, where he manages the Conflict, Transitional Justice and Governance program and the National Memory and Peace Documentation Center. “Transitional justice means auditing the past – whether a moral, forensic, or human rights-based audit. This tends to attract fears about the unknown, especially among the actors involved.